It’s especially important to keep your cats hydrated in the summertime. If you have outdoor cats or no air conditioning in your home, cats feel just as uncomfortable and thirsty as we do when it gets really hot outside. One of the keys to staying cool and healthy in hot weather is staying hydrated, so make sure your cats have access to plenty of water. But water in a conventional cat bowl can get scummy, hairy and all-around gross. Who wants to drink that? It may actually discourage your cats from hydrating when they need it most. You can solve this hydration problem by getting a cat drinking fountain for your cats. 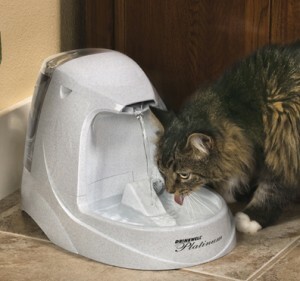 A cat drinking fountain produces a free-falling stream of water that constantly refreshes itself through a pump system. More than one gallon of water cycles through a charcoal filter, which removes debris, bad tastes and odors, before it becomes available for your cat to drink. The circulation system cools water naturally, and the whole fountain is easy to disassemble for cleaning. You can even add an additional capacity reservoir to increase the amount of water that flows through the drinking fountain, which is ideal for multiple cats.